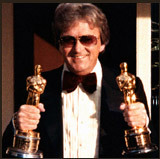 Double Oscar and Grammy winner Leslie Bricusse is a writer-composer-lyricist who has contributed to many musical films and plays during his career. He was born in London, and educated at University College School and Gonville and Caius College, Cambridge. At Cambridge, he was President of the Footlights Revue Club and founded the Musical Comedy Club. There, he co-authored, directed and performed in his first two musical shows, “OUT OF THE BLUE” and “LADY AT THE WHEEL”, both of which made their way to London’s West End. He also found time in the gaps to acquire a Master of Arts Degree. The late, great Beatrice Lillie plucked him out of the Footlights Revue at the Phoenix Theatre, and made him her leading man in “AN EVENING WITH BEATRICE LILLIE” at the Globe Theatre, where he spent the first year of his professional life writing another musical, “THE BOY ON THE CORNER", and the screenplay and score of his first motion picture, “CHARLEY MOON”, which won him his first Ivor Novello Award. That year he decided to drop the possibilities of directing and performing, and concentrate his career on becoming a full-time writer-composer-Iyricist. His subsequent stage musicals include “STOP THE WORLD - I WANT TO GET OFF"; “THE ROAR OF THE GREASEPAINT - THE SMELL OF THE CROWD”; “PICKWICK”; “HARVEY”; “THE GOOD OLD BAD OLD DAYS”; “GOODBYE, MR. CHIPS”; “HENRY'S WIVES"; “SCROOGE”; “SHERLOCK HOLMES”; “JEKYLL AND HYDE”; “NOAH’S ARK”; “SAMMY”; “CYRANO DE BERGERAC”; “KENNEDY”; “VICTOR/VICTORIA” and “IT’S A DOG’S LIFE!” He has written songs and/or screenplays for such films as "DOCTOR DOLITTLE"; “SCROOGE”; "WILLY WONKA AND THE CHOCOLATE FACTORY"; “GOODBYE, MR. CHIPS”; “SUPERMAN”; “VICTOR/VICTORIA”; “SANTA CLAUS - THE MOVIE"; “HOME ALONE I & II”; “HOOK”; “TOM & JERRY — THE MOVIE”; “GOLDFINGER”; “YOU ONLY LIVE TWICE”; "THE LAST EMPEROR”; various “PINK PANTHERS” and “THE GREAT MUSIC CHASE”. Bricusse has written more than forty musical shows and films, and over the years has had the good fortune to enjoy fruitful collaborations with a wonderful array of musical talents, includlng Anthony Newley, Henry Mancini, John Williams, John Barry, Jerry Goldsmith, Jule Styne, Quincy Jones, Andre Previn, Frank Wildhorn and Peter Illyich Tchaikovsky (whose “NUTCRACKERSUITE” he adapted into a song score). Bricusse is one of very few people in the world of stage and screen musicals who contribute all three creative elements — book, music and lyrics - to a show or film, a feat he has achieved some 25 times. He has also written words and music (but not the book) or book and Iyrics (but not the music) to a further dozen projects in his various collaborations. His better-known songs include “WHAT KIND OF FOOL AM I?”‚ “ONCE IN A LIFETIME", “GONNA BUILD A MOUNTAIN”, “WHO CAN I TURN TO?”‚ “THE JOKER”, “YOU AND I", “FEELING GOOD", “MY OLD MAN’S A DUSTMAN”, “WHEN l LOOK IN YOUR EYES”, “GOLDFINGER”, “CAN YOU READ MY MIND?" (The love theme from Superman), “YOU ONLY LIVE TWICE”, "LE JAZZ HOT", “ON A WONDERFUL DAY LIKE TODAY", “TWO FOR THE ROAD", “THE CANDY MAN", "THIS IS THE MOMENT", "THANK YOU VERY MUCH", “CRAZY WORLD", “PURE IMAGINATION" and “OOMPA-LOOMPA-DOOMPA-DEE-DOO". He has been nominated for ten Oscars, nine Grammys and four Tonys, and has won two Oscars, a Grammy and eight Ivor Novello Awards, the premiere British Music Award. Hundreds of Bricusse’s songs have been recorded by major artists, including Frank Sinatra, Nat King Cole, Judy Garland, Aretha Franklin, Barbra Streisand, Sammy Davis, Jr. (who recorded 60 Bricusse songs), Tony Bennett, Shirley Bassey, Tom Jones, Petula Clark, Julie Andrews, Liza Minnelli, Andy Williams, Bobby Darin, Rex Harrison, Kate Smith, Elaine Paige, Anthony Newley, Michael Feinstein, Bette Midler, The Moody Blues, Nancy Sinatra, Lena Horne, Sergio Mendes, Nina Simone, Dionne Warwick‚ Robert Goulet, Matt Monro, Ray Charles, Ethel Merman, Placido Domingo, Jennifer Holliday, Danny Kaye, George Burns, Robbie Williams, Mariah Carey, Linda Eder, Diana Krall, Maroon 5, Michael Buble’, The Black-Eyed Peas, Muse, and Jennifer Hudson. In 1989 he received the Kennedy Award for consistent excellence in British songwriting, bestowed by the British Academy of Songwriters, Composers and Authors, and was inducted into the American Songwriters’ Hall of Fame - only the fourth Englishman to be so honoured — after Noel Coward, John Lennon and Paul McCartney. The stage version of “VICTOR/VICTORIA”, written with Blake Edwards and Henry Mancini, which successively starred Julie Andrews, Liza Minnelli and Raquel Welch at the Marquis Theatre on Broadway, and has since been seen worldwide in many international productions. Bricusse’s stage musical version of Raold Dahl’s “WILLY WONKA” opened at the Kennedy Centre for the Performing Arts in Washington DC in November, 2004, after a prestigious world premiere in the East Room of the White House attended by President George W. and Laura Bush and an invited audience. The show has since enjoyed thousands of productions across the United States. Another Bricusse perennial, his musical version of “SCROOGE”, in which Anthony Newley starred at the Dominion Theatre in London’s West End, is also seen each year in many productions around the world. The title role was played by Richard Chamberlain in the U. S., Keith Michellin Australia, Ichimura in Tokyo, and currently stars Tommy Steele in his tenth season in the role in the United Kingdom, including two at the London Palladium in 2005/6 and 2012/13. A new Japanese production opened in Tokyo in 2013/14. For “DOCTOR DOLITTLE”, which played for four years in the U. K.‚ starring Phillip Schofield and almost one hundred animatronic animals created by Jim Henson’s Creature Shop, Bricusse served as librettist, composer, Iyricist and co-producer. A major U. S. production followed in 2003, eventually starring Tommy Tune as Dolittle in 2006. “CYRANO DE BERGERAC”, Bricusse’s second collaboration with Frank Wildhorn, opened triumphantly in Tokyo 2009, and again in 2012/13. Further productions are scheduled to open in London and South Korea in 2015. “SAMMY”, Bricusse’s biographical musical about his friend Sammy Davis Junior, broke every box office record when it opened at San Diego’s Old Globe Theatre in 2009, and is now preparing both a Broadway production and a major motion picture. “THE GREAT MUSIC CHASE”, Bricusse's “NUTCRACKER” collaboration with Tchaikovsky, with screenplay and lyrics by Bricusse, is currently in productionas an animated motion picture in the U.S. and Canada. Current projects include “PURE IMAGINATION”. Bricusse’s songbook show containing 60 songs from 60 years of stage & screen songwriting, as well as the most ambitious project of his career, now completed, a Iyrical adaptation of the instrumental works of George Gershwin (“RHAPSODY IN BLUE", “AN AMERICAN IN PARIS”, “CUBAN OVERTURE” and “CONCERTO IN F") entitled “A FEW WORDS WITH GEORGE". Bricusse plans to combine a world premiere concert in London with an all-star recording of the work.